Embroideries are needle and thread-wrought decorations on cloth and leather. This is a skill once taught to young girls in school, at home or by other embroiderers, as it was custom to embroider in society. The generation of young rebels of the 1960s and 70s pointed girls towards other values and a different way of spending their leisure time, while well-stocked stores and television programmes attracted adults. Embroideries had become old-fashioned. There are nevertheless still at least 300 women and some men embroidering in the Gorenjska region. Embroideries are an attractive heritage left to us by our ancestors. Today, embroidering is also a pastime, relaxation and a reason for socialising. Embroidered garments and equipment have been used by monarchs and the Church right up to the 17th and 18th century, when noblemen and townspeople also began using embroideries to decorate their residences and clothes. The wealthier rural households rapidly took to this new innovation… It can be assumed that already in the mid-18th and certainly no later than at the beginning of the 19th century, some homes already owned embroidered sheets, pillowcases and towels as precious and prestigious pieces of furnishings. We can infer from preserved artefacts, that the majority of such furnishings was to be found in the farms of the Gorenjska region. 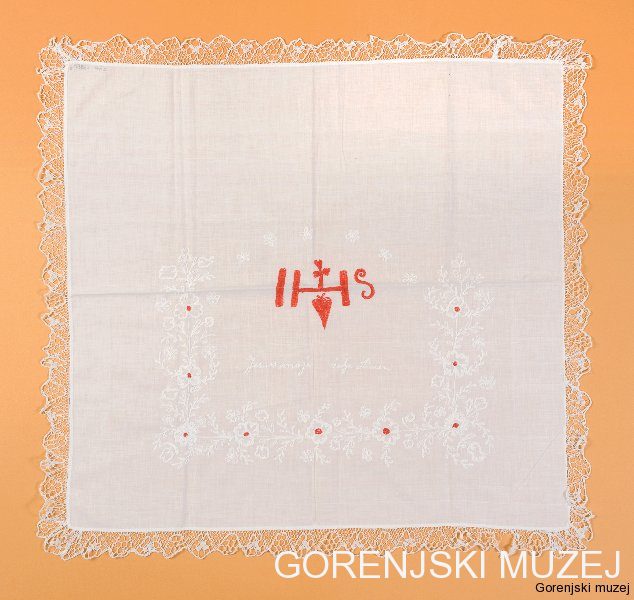 The Gorenjska Regional Museum holds several pieces of counted-thread embroidery employing the cross-stitch technique with various variations of the carnation motif. A sheet from Podkoren is decorated on one side with three strings of ornaments in blue woollen yarn and two trimmings from a broad lacy ribbon in between the embroidery. The sheet comprises two pieces of linen joined together by a lacy trimming. The ornamented part of the sheet ends with bobbin lace. The sheet and the pillowcase from Podkoren have been embroidered with red and blue woollen yarn. The pillowcase from Begunje, which is embroidered with black wool along its entire surface, has probably been made following older patterns. The oldest preserved embroidetablecloth is from the year 1841 and was used to cover a wicker basket full of Easter delicacies. It has been embroidered following a prepared design using red and partially blue cotton yarn along the entire surface in rather thick and fine pattern of garlands and flowers. 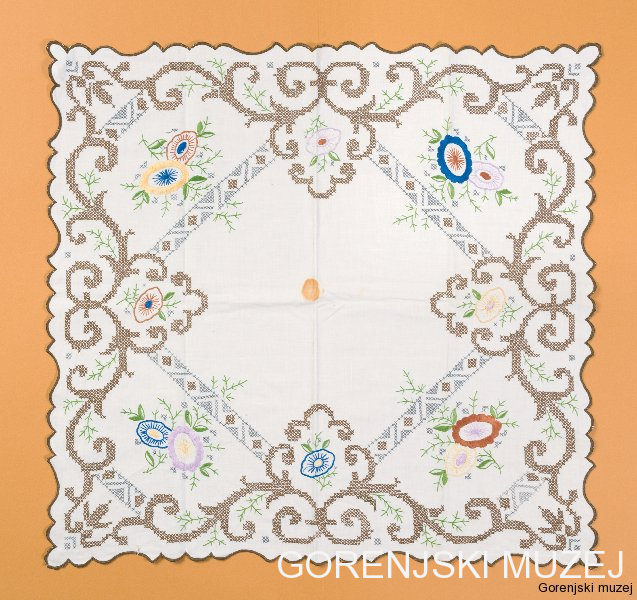 In the surroundings of Kranj, there is at least one more similar tablecloth to be found originating from the year 1840. The years are seldom found on tablecloths. 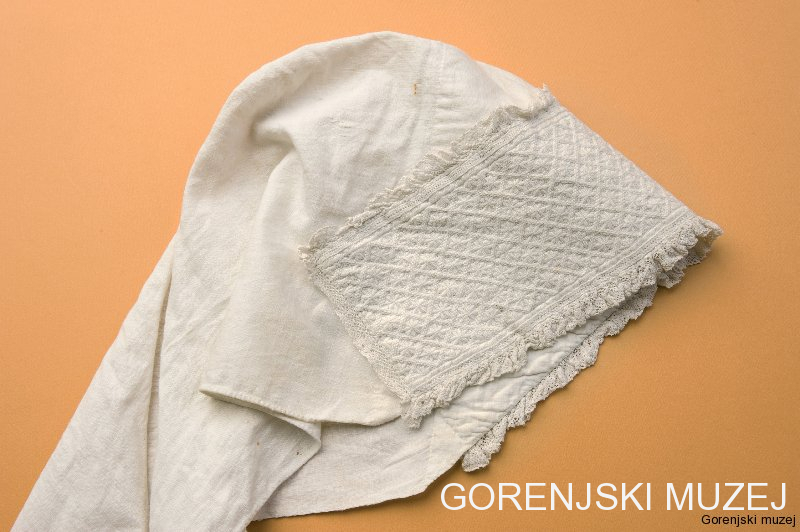 The collection of the Gorenjska Regional Museum has one more cloth for the family altar with the year 1897. Two Easter doilies from the second half of the 19th century from a rural merchant family have been skilfully embroidered with red and white yarn following a prepared design. Easter cloths are mostly very well preserved, as they were used only once a year. Some parts of the Gorenjska region have their own characteristics. 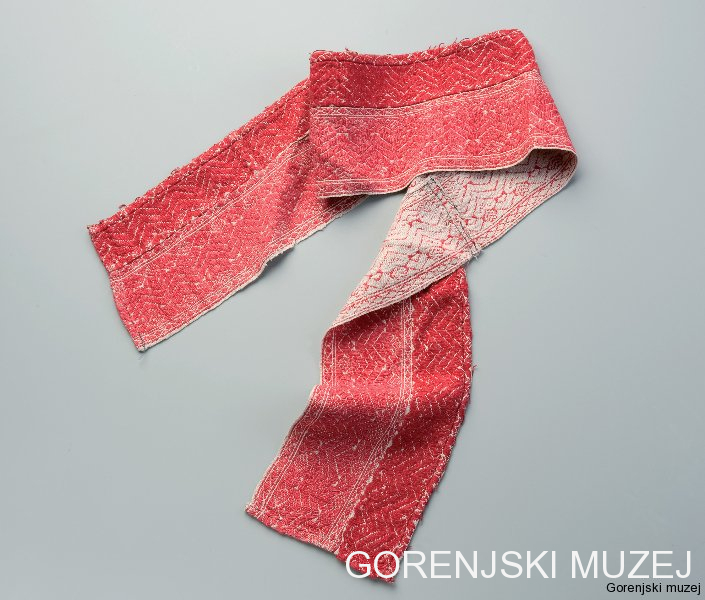 In Bohinj, one can find preserved cloths for God’s Corner made on gauze. In the Upper Sava Valley, cloths depicting a lamb carrying a banner and standing on a book with seven seals with an anchor and a cross underneath it and a chalice next to it were used for God’s Corner, for altars for the Corpus Christi Procession (the so-called pranganje – processional Monstrance) as well as to decorate the table upon the coming of the priest to a dying man (the so-called last rites cloths). At the time of the reign of Maria Theresa of Austria, some schools employed needlework teachers for girls of all social classes. In primary schools, embroidery was an obligatory part of the curriculum for one hundred years – from the introduction of obligatory primary school classes in 1869 to the 1960s. Since then, embroidery and other needlework techniques are still being taught in some Slovenian primary schools as a non-obligatory element within the framework of extra-curricular activities or optional compulsory activities. 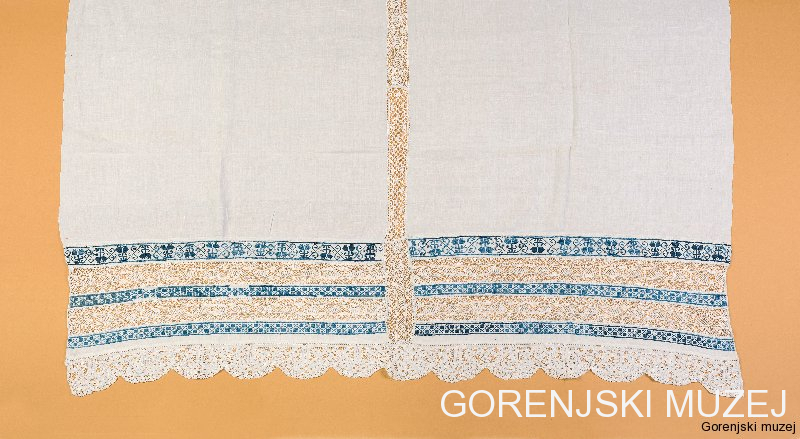 The most beautiful embroidered articles in the Gorenjska region were born centuries ago in the Velesovo, Škofja Loka and Kamnik convents. Embroidery was also part of the tailoring profession which was chosen also by some women. The characteristic items of professional embroiderers dealt with festive folk costumes of the Gorenjska region, such as the coifs with golden embroidery from the 18th century. The girls wore the so-called zavijače, specially designed triangular kerchiefs decorated on the front with white embroidery or brocade weaving. 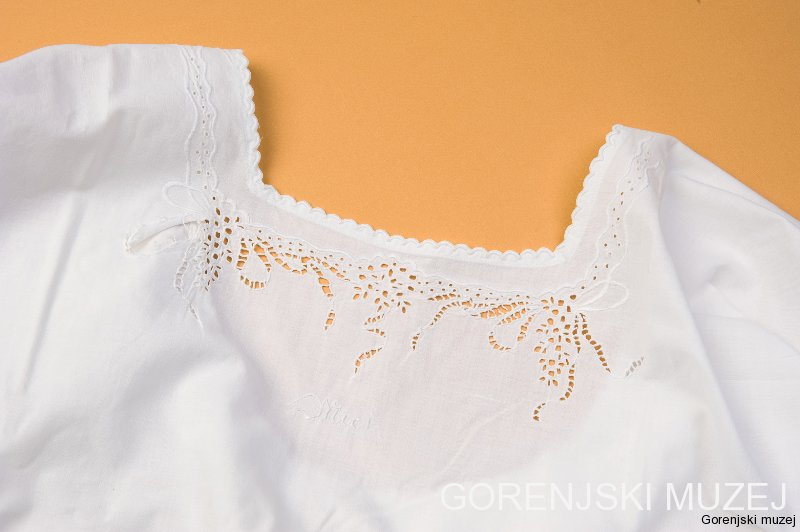 In the 19th century, white embroidered kerchiefs – peča (pl. peče) – asserted themselves on a large scale, being tied by women in various ways as an accessory to festive clothing and which also became a component of the Slovenian national costume. There are numerous preserved peče to be found. 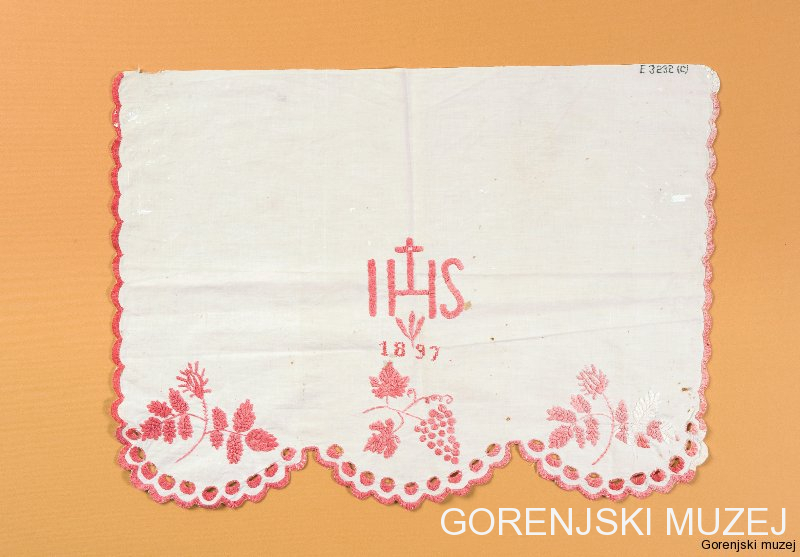 Embroidery as a professional activity was taught at the Ljubljana Trade School operating from 1888 to 1961. Since then, it has not been possible to learn embroidery as a trade within the framework of the regular schooling system in Slovenia. In the 20th century, embroideries were an integral part of life in both the everyday and festive image of furnishings, while not so much in clothing. The majority of preserved items date from the first half and middle of the 20th century when embroidery was especially appreciated. During the time between the two World Wars, it was especially popular and desirable for young girls and women to embroider as part of their leisure time activity, especially on Sunday afternoons and during the winter evenings, in some parts still by light of a paraffin lamp. 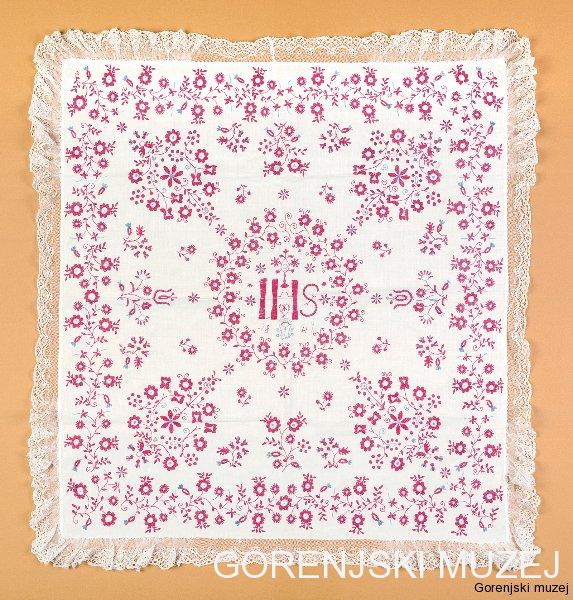 Many girls embroidered their sheets, covers, tablecloths, underwear and aprons with monograms or more or less complex white or coloured patterns. In this way, the poorer girls were as well able to prepare a beautiful trousseau for their wedding. 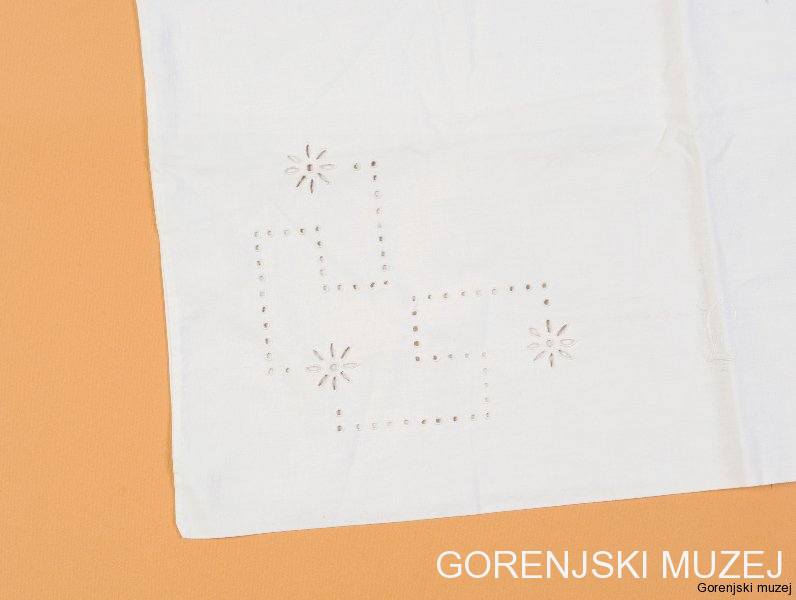 As part of searching for roots and the ethnic origin not only in Slovenia, the expression “national stitch” was born almost a hundred years ago, the so-called national fabric, the expression of the nation’s “soul” in embroideries. Documentary material regarding the design of Slovenian motifs was collected according to individual regions by Albert Sič in 1918. 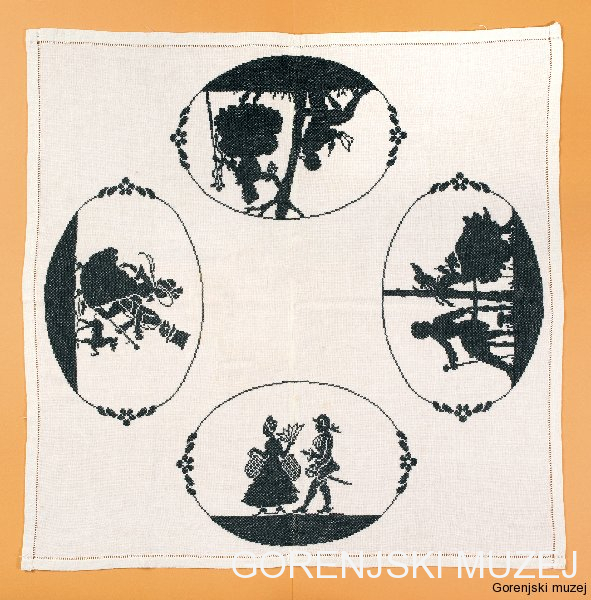 In her work Narodne vezenine na Slovenskem (National Embroideries in Slovenia), Neli Niklsbacher-Bregar in the late 1960s published the patterns of counted-thread embroidery from the preserved embroideries of museum and private collections. Examples of cross-stitch embroidery were chosen exclusively from the Gorenjska region with the explanation that: “It generally holds true that cross-stitch embroideries have their origin in the Gorenjska region…” For the needs of the national and regional identification, a chosen part of the oldest preserved embroideries in the Gorenjska region was used to establish the blue and red colours, the cross-stitch technique and the motif of carnation blossoms as characteristics of embroideries of the Gorenjska region.